Office-Politics » Nice Perfume, must you bathe in it? Nice Perfume, must you bathe in it? That is what I want to say to her but I won’t. I have this co-worker. She is a very nice woman. In fact, she is the one who trained me. She got a promotion in the same office and I took her old position. She has taken to wearing a very heavy perfume/cologne or something (not sure what it is). She did not wear it when I was in training with her; at least not to this extent. It is enough to gag me out!! It’s the type of thing you can even taste it on your tongue a little. You can tell when she has been in the copy/work room because of the scent lingering. I think she also must reapply throughout the day or something. I have only been in this division a little over a year now. I don’t want to make any problems for myself. I am in an admin assist position – low in the pecking order – and can’t afford to alienate or offend anyone and honestly don’t want to. I have been secretly hoping someone who is closer or better friends and has known her longer might say something in private to her but so far that hasn’t happened. I can’t imagine no one else noticing the strong scent surrounding this individual! I like her but it is difficult to me be even near her at all for more than a couple minutes because of this. In addition, some other coworkers spray air freshener and use strongly scented lotions and essential oils. Our office is on an upper floor of a downtown high-rise. Poor ventilation and obviously no windows to open. I have a cubicle, not an office. It is a small work unit of about 30 people. We share tons of common workspace and have to work closely together on projects and daily tasks. So, it isn’t a situation where I can just keep myself away from it. I am highly chemically sensitive and allergic. Things with these types of perfumes and ingredients in them cause my eyes to itch and water, sneezing, coughing, runny nose, my skin to get red and itch and even occasionally upset stomach. I do not tolerate it well physically at all! People who don’t have these problems don’t seem to understand how badly it can affect those of us who do. What can a person with my condition do in a situation like this? Should I go to the woman wearing the offending perfume personally and talk to her? Should I mention the issue to our mutual supervisor ? Wear a gas mask in her presence as a subtle hint (just joking – er – sort of). Or, do I simply stock up on the Benadryl and continue to suffer in silence? I really could use some help on this one. I’ve had firsthand experience with a perfume-bather so I know how touchy this issue is. We had an employee who also ‘bathed’ in it. Every pore oozed fragrance. It was so repulsive I gagged. You just had to enter the building and you knew whether she’d arrived. And yet all of us were reluctant to mention it. I eventually figured out that she was using the perfume to mask the smell of cigarettes. But we all thought she was a nice person and nobody wanted to hurt her feelings… I was just about to break the bad news to her when she left (with no notice)! Oh well. Now I wouldn’t hesitate to speak up! 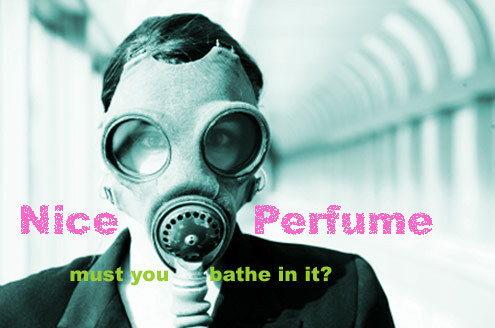 Perfume can make breathing difficult. (The American Lung Association says 72 percent of asthma attacks are caused by perfume.) But you’re not the boss, so I think your caution is very wise. In your case, you need 3rd party ammunition, so no one will take it personally and you won’t feel you are being overly demanding as an administrative assistant. You don’t want to offend the person(s) — but on the other hand you do want to breathe! One thing you have in your favor is timing. Environmental concerns are all over the media now so the awareness of issues like yours is much higher. I recently attended a women’s environmental meeting where we were told in advance that a woman attending had serious fragrance allergies and if we wanted to come, to please not wear perfume or any product that contained fragrance otherwise she might have an attack. I clicked the agreed button. But even with the best intentions, not using fragrance products or deodorant that day was a behavioral challenge for me! Just as I was dressing, I reached for some light cologne and then caught myself! Yikes! I would have had to shower all over again if I’d goofed! So, what 3rd party ammunition can you get? Getting a note from your doctor about your fragrance allergies is the perfect 3rd party ammunition. It takes the onus off you, and makes the issue ‘medical’. From what you’ve written below it seems a very straightforward solution. If you do go, make sure your doctor is knowledgeable about the issue — if he or she is not — find another! This is a serious step and one that you would not want to take unless absolutely necessary. Some people with fragrance sensitivity will have a disability under the ADA and some will not. The Job Accommodation Network (JAN) has a pdf on the issue: Office of Disability Employment Policy of the U.S. Department of Labor. It is written to help employers determine what accommodations might be necessary, and to comply with Title I of the Americans with Disabilities Act (ADA). Below are two articles that are worth reading. Give an educational package about your condition to HR. Assemble educational information and your doctor’s note into a package and give it to HR and your Supervisors. When your coworkers understand it’s a serious health issue, some (if not all) will be more willing to forgo the perfume. An employer has the right to decide what is reasonable when making accommodations for a fragrance sensitive employee. JAN suggests that companies incorporate the accommodation ideas below into their company policy. This is a step that HR would probably have to take. The JAN document also includes sample policy language for companies to share with staff. Good luck! I hope these ideas are helpful to you. Please let me know how things work out! Thanks for writing to Office-Politics. I developed respiratory sensitization to a common fragrance chemical in 1988. Unlke the situation here, I simply had no choice but to stop working as nurse. Just a whiff of an offending product would cause severe constriction of my airways. I started researching information and was astounded to learn that ingredients in fragrance do not have to be revealed. Even after determining the chemical I was allergic to (took 8 years) it still did not help avoid exposures. Even those willing to accommodate me had no way of knowing what products they could use. There is much more information available now, though not as much awareness as you would think. Fragrance is a frequent trigger for migraines and asthma. Some fragrance chemicals have carcinogenic effects, cross the placental barrier, are present in breast milk, and persist in the environment. People have no clue what they are bathing in. Then, when is it safe to return? Not when we can still taste the perfume 40 minutes after the wearer has left…Please. In simplest terms, it should be an assault charge to cause someone else this type of suffering. For several years I thought I was just a wimp and hated myself for being the way I am! 20 years ago I wore cologn and could have caused problems for others (I hope not). I too work in an office in a cube and I am getting to the place I TASTE like alchol from the perfumes the entire week. It does not go way when I get home. Usually on the weekend I don’ notice it. I too get terrible headaches, my eyes burn, my throat burns and my ears stop up. I have a letter from my allergist stating I have Vasomotor Rhinitis and gave it to HR. They have been very nice to me and even bought a air purifier for a 8×8 room that did not take the scents away. I don’t know what else to do. I actually loose sleep thinking about this and dreading to go to work. If I could afford to quit I would but I need health insurance. I just had sinus surgery from all the sinus infection I’ve had and am getting immune to antibotics because I’m on them every 6 to 8 wks for sinus infections (and I’ve not had a cold for a long time!) WHAT CAN WE DO TO MAKE THE WORK PLACE SCENT FREE? The state of Ohio is now SMOKE FREE. I don’t see much difference. I too have problems with fragrance in office situations, department stores and grocery stores. Besides the fact that virtually all personal care products have fragrance in them, fragrance is also in virtually all cleaning products. Makes you wonder how they really smell if they did not have the fragrance in them. Nowadays, most fragrance is petro-chemical based. I have been in a grocery store and passed bounce infused with Febreze display, I passed it the first time and immediately had a sharp intense pain sensation of a knife sticking into my forehead. I looked around for the offending person that would wear such a smell and shrugged and kept on going. I inadvertantly walked past the display again (with exactly the same reaction) and finally realized that, that was what was causing the problem. It was soooo vile and here the store had plunked it right in the midst of the food section. I purposely avoid the laundry aisle and have not been able to go down one for more than 20 years. I foresee the same thing happening to fragrance wearers that happened to smokers. At least banning the use in the workplace and using natural deoderizers (baking soda, etc.) and fragrance free cleaning products. Unfortunately we are the ones who are in the forefront of this revolution similar to the suffragettes who fought for the right for women to vote. Thanks for the posts. I have known I had a sensitivity to some smells for several years. Ever since my son bought some Febreeze and sprayed everything in his room. Ugh…about drove me out of my own house. I now notice very specifically two distinct odor types. I relate those to smells I have known in the past, Febreeze and insecticide. It can be perfumes, candles, air fresheners or whatever but most often it has one of those distinct odors. Well I now work in a cubicle enviornment. Guess what, it smells here. As people walk by wearing the perfumes…wham! I am hit with it. In fact, I know when one lady arrives at work. My eyes water, sinuses clog up and the smell…oh my! It is like she just bathed in it before she got out of her car. Nice lady but my goodness. I really hate that these smells bother me so but I do not know what I can do to alleviate my sensitivity. Probably nothing. Whoever wrote about Febreeze…thank you because that is a major offender to me. And to think, people believe it smells good? Only thought I have for those who ask about it in the workplace and how to handle it…..file a workers compensation claim. File it for the doctors visit, file it for the missed days of work due to the migranes, file it for surgeries etc….once businesses start having to spend $$$, you will then have their full attention to the matter. I am allergic to a number of things, ranging from ragweed to cigarettes to Febreze. But I love perfume. I try not to overdo it and I DO understand allergic reactions, etc… but being expected to use no scented products whatsoever seems like going overboard to me. Like expecting everyone to buy a whole group of unscented toiletries because one person is sensitive to a chemical/chemicals. How about working someplace where you can open the windows, for example? I am allergic to common plants and trees, but I can’t change the environment completely, so I have to compromise. I think compromise is the best way to handle this issue. Nothing has ever worked, not even at the Doctors office. If you try you will be called filthy names. Not even the places of worship offered any relief. I have become a recluse because of the severe treatment here in Hamilton Ontario. Even with graphic intense descriptions as we have McMaster hospital for kids right here in town. NO ONE GIVES A DAMN. The biggest line up at lu8nch is the nurses and Doctors outside getting their smokes. We have to get them to care first. Good luck doing that. My advice is good luck. People don’t care unless its about them. I post a fragrance free sign in my cubicle. I asked the HR Department to put up educational materials during May asthma awareness month. 1 out 3 asthma attacks are due to perfumes. I post chemical information in my cubicle. Most women do not know that perfumes contain up to 37 chemicals including Phalates which cause cancer. “oh she has lung cancer but does not smoke?” My first question is “Did she wear a lot of perfume.” We got rid of second hand smoke, now we have to get rid of second hand perfume.